Bidding for contracts to build a huge hydroelectric dam on a tributary of the Amazon in Brazil has been stopped for a second time. A court granted an injunction halting the auction due later in the day. 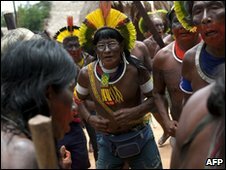 The government says the Belo Monte dam on the Xingu River is crucial for economic development. Indigenous groups and environmentalists oppose the dam, saying thousands of people will be displaced and a sensitive ecosystem damaged. The latest development came just a day before Tuesday's planned auction and it is highly likely there will be further legal wrangling. A spokesman for Brazil's electric energy agency, Aneel, indicated that the auction would go ahead if the injunction was lifted at the last minute. Last week, a judge ruled bidding could proceed, overturning an earlier order to halt. The government says whoever is awarded the project will have to pay $800m to protect the environment. Belo Monte would be third largest hydro-electric dam in the world, after the Three Gorges in China and Itaipu, which is jointly run by Brazil and Paraguay. It is expected to provide electricity to 23 million Brazilian homes.